You can see the new ( well almost) trailer for the Ultimate Spider-man cartoon on Disney XD right here. To be honest i didn't really like it. I felt that Disney should have just done another season of Spectacular Spider-Man. Now that was a show that got the vibe of Spidey right. 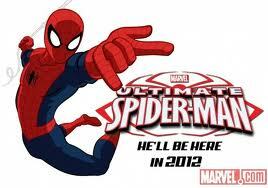 Ultimate Spider-Man while I'm sure that little kids and hell even some teens would love this show, it just feels like way to much is being thrown at me. Spider-Man to me has always been a loner and this show has him teaming up with other heroes in the Marvel U. I think Spidey is best when he has to fight to overcome the odds to win. I also don't like that we get Spider-Man wearing the Armor he had IN Civil War to fight Iron Man. Again i know this looked cool but it just felt a little off to me. The animation looked like a bad cross between the 1990's animated series and Spectacular Spider-Man which looked really strange to me. I think I'm going to pass on this cartoon. I haven't checked out the link but that teaser pic doesn't look the best. It doesn't feel very dynamic. Spidey's foot is cut off by the logo making that positioning feel kind of off, almost like he's trying to bend into the shape of a letter from the alphabet. I agree when you say Spidey should be more of a loner. Isn't he supposed to be this science nerd? But I guess Flash Thompson can't pick on Pete no more since bullying is wrong. It's always been wrong but people are more sensitive to the subject these days, and maybe that's why he's going to be teaming up with a lot of other heroes.